The premise for the show sounded like the punch line for a joke - "A Canadian Mountie arrives in Chicago..."
And that's just what Constable Benton Fraser did, on the trail of his father's killers, and (yes, say it with us now) for reasons that don't need exploring at this juncture, he remained attached as a liaison with the Canadian Consulate. Throughout the show's run, fans were introduced to characters that would become welcome guests in their home - the ghost of Robert Fraser, Lt. Harding Welsh, Detectives Jack Huey, Thomas Dewey and Louis Gardino, Francesca Vecchio, Mort, the mortician, Assistant State's Attorney Stella Kowalski, and, most centrally, Constable Fraser and his first partner with the Chicago PD, Raymond Vecchio and following Vecchio's departure, Detective Stanley Raymond Kowalski, or "Ray". 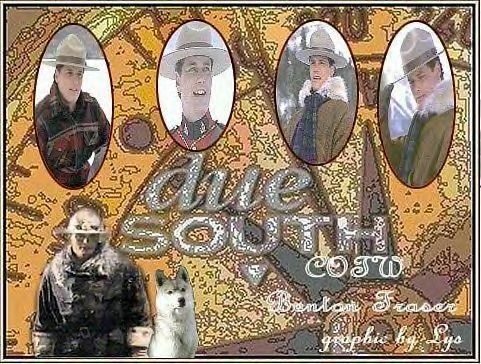 As the show came to a close, the various stories that had been orbiting in the due South universe came together in the two-part series finale "Call of the Wild". In those two hours of magical realism, people from the past returned - namely the once-undercover Ray Vecchio and Holloway Muldoon, the killer of Fraser's mother some thirty years before - and from the chaos dreams became reality and lost souls found their place in the world. Be it a golden bullet that secured Ray Vecchio's retirement to Florida with Stella Kowalski; Francesca Vecchio's immaculate conception, six times; a final, bittersweet moment between Fraser and his parents before walking off together into the great beyond; or the last image - Fraser and Kowalski - who finally has found who he is, namely, Fraser's partner - riding off into the sunrise, ready to embark on an adventure - one can't help but believe in happy endings. This fanlistings site was created as a central hangout for those who share an affection for due South and, namely, Call of the Wild. By joining, members agree to abide by the rules that have been laid out and through membership, they can find other like-minded individuals - creating a community.